This past weekend Mindy and I heading down to Moab to run the Red Hot. This would be my 3rd time at the 55km and Mindy’s first time at the longer version (she ran the 33km last year). Weather has been unusually warm the prior few weeks in SLC, but the thought of warm dry southern Utah weather still sounded nice. Well, we didn’t get any of it! 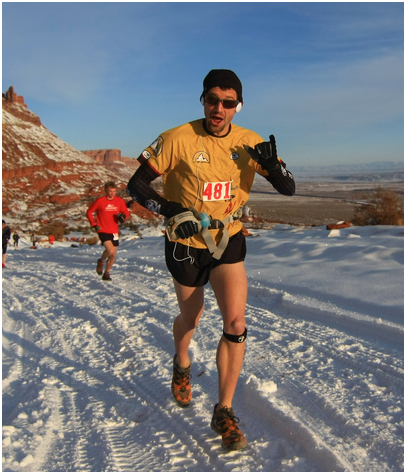 The temps were below freezing at the start and much of the course was under snow. The first loop even involved some nice post-holing, which made me feel at home. I ended setting a P.W. (Personal Worst) with my slowest time to date of 4:58. While this may sound strange, I was still pretty happy with it given my limited training and the conditions. Once the sun came out and warmed things up it was actually a great experience. Mindy whipped out a fabulous 6th place overall in 6:18. Woohoo!